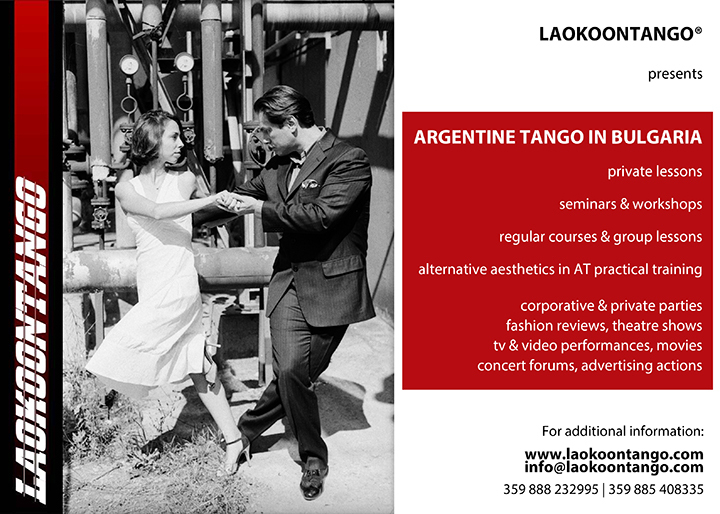 Every Sunday LAOKOONTANGO® starts in Sofia a new intensive Argentine tango course for absolute beginners. The lessons start permanently, regardless of the number of pairs (including if there is one pair only)! The lessons take place every SUNDAY, 7:00 - 9:00 pm, 51 Alexander Stamboliyski Blvd., fl. 3, Sofia. The course contains 4 consecutive double lessons (4 Sundays - 8 thematic practical lessons). The training is carried out by unique and а special consolidated programme created by LAOKOONTANGO®. For additional information concerning the course and the requirements check "Education and Seminars" or use the contact form*. * Please, keep the exact condition of preliminary and explicit confirmation of your participation in the course! Please contact with us by phone, e-mail or use the contact form in the website!